Robert Reich claims that only government can get America out of the mess it is in. He’s wrong. America’s ongoing jobs depression – which is what it deserves to be called – is the worst economic calamity to hit this nation since the Great Depression. It’s also terrible news for President Obama, whose chances for re-election now depend almost entirely on the Republican party putting up someone so vacuous and extremist that the nation rallies to Obama regardless. The problem is on the demand side. Consumers (whose spending is 70% of the economy) can’t boost the American economy on their own. They’re still too burdened by debt, especially on homes that are worth less than their mortgages. In addition, their jobs are disappearing, their pay is dropping, their medical bills are soaring. Businesses, for their part, won’t hire without more sales. So we’re in a vicious cycle. The question is what to do about it. When consumers and businesses can’t boost the economy on their own, the responsibility must fall to the purchaser of last resort. As John Maynard Keynes informed us 75 years ago, that purchaser is the government. Government can hire people directly to maintain the nation’s parks and playgrounds and to help in schools and hospitals. It can funnel money to help cash-starved states and local government so they don’t have to continue to slash payrolls and public services. And it can hire indirectly – contracting with companies to build schools, revamp public transportation and rebuild the nation’s crumbling highways, bridges and ports. As I noted a few weeks ago who cares who does the things that the economy wants and needs, just so long as they get done? The problem is, that government very often has no clue what the economy wants or needs. Only the people out in the economy know what they want, and what they want to spend their money on. That’s why when government tries to pick winners and losers, it very often gets it totally and stupendously wrong. Look at the fact that each job created costs $250,000 — money which use be taken from the productive apparatus of the economy and spent on projects which may or may not be helpful overall. Look at the humungous cost of the wars and the corporate bailouts — all of which has to be taxed from the productive economy. That’s a pretty strong correlation. Now if the state is enlightened and lucky, sometimes government investment creates huge successful payoffs. But that correlation shows that in recent years government hasn’t been enlightened, and it hasn’t been lucky. The way to create jobs in America is to end the corporate bailouts, end the crony capitalism, end the wars and give the money back to the American people. That would create a new wave of job-creating small businesses, raise demand, raise the ability of the poor and middle classes to pay for that demand, and (with the current tax load, but without the burden of the huge military spending) generate enough revenue to start paying down the humungous debt load. This entry was posted in Current Affairs, Politics and tagged black swans, inequality, leon trotsky, obamanation, robert reich, socialism in one country, stagnation, warren buffett. Bookmark the permalink. That chart is awful. I could just as easily say that as unemployment goes up, Government is forced to spend more as a percentage of GDP. There is no discernible correlation that you thing is pretty strong. I mean, ipso facto, the stronger the economy (and larger the GDP) the smaller the same amount of government spending will appear as a percentage. 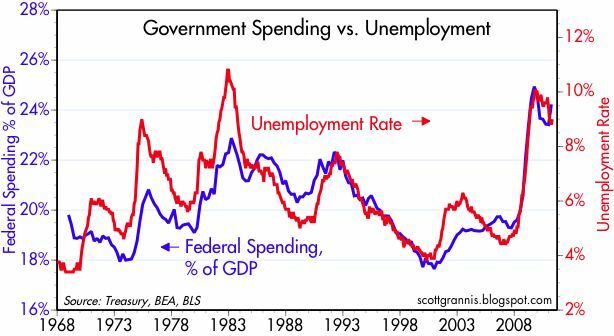 In fact at several points in that chart it appears that unemployment leads government spending, not the other way around. Aziz, love your posts but in this case I think the science maxim of ‘Correlation does not mean Causation’ is applicable. I’m not trying to prove that in this case there is a causal link between higher government spending and unemployment, even if that may be the case. I’m trying to prove that higher government spending doesn’t necessarily correlate with lower unemployment, which is essentially Reich’s key piece of advice: the government needs to spend more and unemployment will go down. There’s a subtle difference, and the chart proves that this is untrue. If there was always a lag, then Reich might have more of a case, but there isn’t. Reich needs to address the idea that taking productive capital out of the productive economy to fund projects which may or may not be wanted/needed negatively affects private spending on jobs. As I have noted before, the biggest job creators in America are small businesses too small to benefit much from government contracts and corporate tax loopholes. Taxes (at least in our current system) are always on economic activity. And perhaps that is the problem. Perhaps a better alternative is to shift some of the burden to taxing economic inactivity (i.e. hoarding). Unfortunately the only policy weapon commonly used in that regard is inflation, which ends up hitting the poorest (welfare recipients, retirees, etc) the hardest. I have a better idea: give bondholders haircuts. That way, you’d kill two birds with one stone through additional debt reduction. May I add that I believe that Governments should tax a % of GDP and allocate to a sovereign wealth fund, for a rainy day when they need to kickstart the economy with a fiscal injection and break a deflationery spiral. However I don’t believe in Crony Capitalism or Socialism for the sake of spending. This breeds dependency, nepotism and misalocation/waste. In Australia there is a number of Private Public Infrastructure projects where Government funding provides a back stop to Corporate Investment (Toll roads for example) This reduces Investment risk, and ensures efficiency as the private sector tries to maximise profit. Provided the formulae is not to weighted in favour of the Private Partnership (Cronyism) it is a good outcome for the country and public. This system is a little similar to China, but I bet there is rampant Cronyism for Party members. I believe the USA needs to implement projects like the Hoover Dam to kickstart the economy, not spend on pavement extensions as a token gesture. Massive projects (Excluding Millitary) like the Third Reich are needed now. With the clear evidence that the world flocks to the USA dollar, a huge programme of Bond issuance will be warmly accepted by the world investment community, and the USA may just get the new tech infrastructure it needs to lead the world (morally and economically again. You cannot make people buy things!Essentials possibly Yes but non -essentials well No!And there’s the problem.If people decide to pay off their credit cards and not spend then how do you make them part with their money.Capitalism is the latest ism to fail and America as the Kings of the Capitalism are suffering because of this.If America wants to get out of the mess they are in it’s time for them to find a new ism or find a new spin and do capitalism with a small c!Obama is not the man to do this.He talked change but in the end he wasn’t interested in change at home he was more concerned with changing America’s image abroad-which he did at first but his lack of detail at home has made America look very badly run and now countries see America as a failing superpower! Congressman Paul Ryan has proposed setting the amount taxable at 18% of the GDP. Ohio State economist recommend maximum economic efficiency is achieved at 11%. Either way 25% is insane. Below are some White House numbers on receipts as a percent of the GDP and expenditures. Pretty clear that cutting spending below 18% of the GDP helps create positive cash flow.